BentoLunch.net - What's for lunch at our house: Look what I made! They both have a 2 tier box in them right now for pictures. The SS one is a bit smaller (I used scrap material), so it only fit some of our boxes. 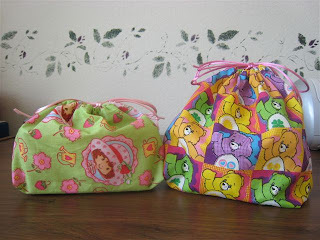 The Carebear one is taller so it can easily accomodate a bento, a snack & a water bottle. I have Mickey Mouse material to make Ben some too. Those are adorable!! I am new (came from Lori Graniss's) to your blog and loving it. Omg! So cute! You just reminded me I have leftover HK fabric from making dd's tag blankets and fleece hats from years ago! YOU SOOOO TOTALLY ROCK!